Trigger marketing or event-driven marketing usually refers to consumer marketing but by focusing on key moments in a company’s life, you can use trigger-marketing in marketing to business. You can increase your sales by contacting companies when they are likely to be hiring new suppliers. The hiring of a chief executive can mark the start of a new chapter in a corporate’s life. A new chief executive is expected to make changes to the way things are done at a company but the saying that ‘a new broom sweeps clean’ also applies to departmental directors and managers heading up teams. In many corporate cultures it is essential to look busy and not accept the status quo. An ambitious new hiring needs to get noticed; he will often fire suppliers and bring in new partners with fresh ideas. And this is the time to get your business card, your website or your LinkedIn profile, in front of the new manager to make sure that you are on the pitch list. As well as being timely, you can make your initial communication relevant to the prospect, maybe offer congratulations on the new job. Electric Marketing tracks new appointments in a series of monthly updates, giving you contact details of newly appointed managers and directors in the high-spending departments of large UK companies. We focus on the people who are likely to be buying in services: chief executive, marketing director, HR director, finance director, IT director , sales director, CRM manager and training manager. Once a month, we email our subscribers a list of all the new appointments we have identified (we phone every company on the list a few days beforehand) with their full contact details. At just £355 for 12 datafiles, one every month for a year, it is the most effective information for b2b trigger marketing campaigns available. We offer ten lists of new appointments, every month, each one focusing on a corporate department. See the full range of new appointments mailing lists here. By being in the right place at the right time, you can win business. Read more about trigger marketing. We’ve been lobbying against the proposed new EU data protection legislation for getting on for two years now. Earlier in 2014 the EU Parliament agreed a piece of draconian legislation that would outlaw list broking, insist on written consent for all marketing communications sent to a named person, with no distinction between b2b and b2c, and effectively finish off personalised marketing to anyone other than your recent customers. If that legislation were enacted it would mean the end of direct marketing as we know it. We will return to the days of writing to Dear Marketing Manager or Dear Stationery Buyer. However the reality is that the EU is still debating what form the legislation will take and what that legislation will be. The European Parliament has voted for this legislation but that does not mean that it will become law. The European Commission, the European Parliament and the Council of Ministers have now all drafted three different versions of the proposed data protection regulation. The European Parliament draft is by far the most damaging for anyone who uses mailing or email lists to prospect for new customers. The three bodies will enter into negotiations as to which elements of each version will become EU law. 2. EU Directive which has to be debated and passed through the UK Parliament at Westminster and to which amendments can be made. The current UK Government is pushing for the laws to become a Directive, which will give UK MPs some leeway to alter the legislation as it applies to the UK. It should be borne in mind that the UK amended the last similar piece of EU legislation (a Directive) with the Electronic Communications Act specifically allowing the sending of B2B emails in the UK without the sender first obtaining consent. The UK coalition government opposes the proposals and is lobbying for them to be a Directive at the very worst. Unfortunately the Labour party is currently in favour of the proposals and has not replied to any of our letters on the subject. As things stand we have at least two years until the law is changed. If your company buys in data to use to prospect for new customers, please write to your MP, explaining what the proposed legislation will mean for you. Also write to Simon Hughes MP who is in charge of the UK negotiation with the EU. The more letters MPs receive, the more attention will be paid to the issue and it becomes less likely that the UK sleepwalks into agreeing to legislation that is damaging for business. The time to write to your MEP has passed as the vote has happened and most UK MEPs (bar UKIP) voted in favour of the new draconian data laws. But it is always worth explaining to an MEP the consequences of their vote and the effect it will have on your business, our industry and the wider economy. As anyone who has ever done cold-calling and appointment setting will tell you, it is difficult to penetrate the mind-set of ‘if it ain’t broke, don’t fix it’. How can you sell into a company which is embedded with another supplier? Sometimes you just get lucky and your cold call hits the buyer when there is trouble with the existing supplier – a price rise, a delayed job – and the buyer is in the mood to make a change. You can increase your new business success rate by contacting companies when they are likely to be hiring new suppliers. We’ve identified a company merger or acquisition as being a key moment in a corporate’s life for hiring new suppliers. When a company buys or merges with another company, it triggers a change in its purchasing habits. It may buy in services to help it cope with the challenge of merging or absorbing the new corporation. The company may not have all the experience it needs to deal with new issues the merger is throwing up. This is when it looks to outsource and when, by being in the right place at the right time, you can win business. As well as being timely, you can make your communication relevant to the prospect. You can grab their interest in the first line by talking about their company’s situation. Instead of presenting your excellent credentials, you can explain how your company’s expertise can help them; either by removing a problem from their in-tray or by taking their business forward. Electric Marketing tracks merger and acquisition activity in M&A News. M&A News isn’t just a list of mergers and acquisitions; it gives you contact details for the key personnel in the companies involved so that you can make your pitch at a time when the company is in a state of flux and momentous change. M&A News focuses on the people who are likely to be buying in services: chief executive, marketing director, HR director, finance director, IT director and legal director. At just £145 for 12 datafiles, one every month for a year, it is the cheapest information for trigger marketing campaigns available. See M&A News for details. What links these brands: Land Rover, Lucozade, Gieves & Hawkes, Pizza Express? Yes they are all big brands with a solid British heritage, but they are no longer in British hands. All of these brands have received major investment from Asia and are majority Asian-owned. If you can see a business opportunity targeting companies with overseas parent companies, Electric Marketing now offers mailing lists with email addresses sorted by nationality of parent company. We don’t believe any other UK mailing list company offers this as a selection criteria. The mailing lists are ideal for any company focusing its marketing efforts on multinational corporations; from international marketing and advertising agencies to multilingual market research teams, from translation agencies, international relocation agents and business language training schools to companies offering legal advice on visa and immigration issues. As with all Electric Marketing mailing lists, all data has been checked within the last 4 months by calling the companies and checking that the information we have is spelt correctly and is up-to-date. See how many contacts we have for each country or region and order your lists on these pages. There is no extra charge for using this marker as a selection criteria. Are you interested in companies from other nations? Email lists@electricmarketing.co.uk and we’ll put your chosen country at the top of our research list and get back to you within the week with a quote. For 30 years the UK Government has pursued a policy of attracting inward investment. From the Nissan factory in Sunderland to the new owners of Land Rover (Indian car maker Tata Motors) and owners of Ribena and Lucozade (Japanese Suntory), overseas companies have invested heavily in UK manufacturing. In recent years House of Fraser has sold an 89% stake to Chinese conglomerate Sanpower before coming back under UK ownership, while high streets host overseas retailers Muji and Uniqlo (Japan), Zara and Mango (Spain) and H&M (Sweden). Wind back to the 1980s and the high street looked quite different. Each company that comes to the UK to do business brings its own culture, language and ways of working. If your company offers services to overseas companies in the UK or if you can offer a particular understanding of a nation’s culture and sensibility, you might want to target companies by the nationality of their parent company. But we’ll be adding India, China, South Africa, Brazil and USA plus any other country of origin for which there is client demand. 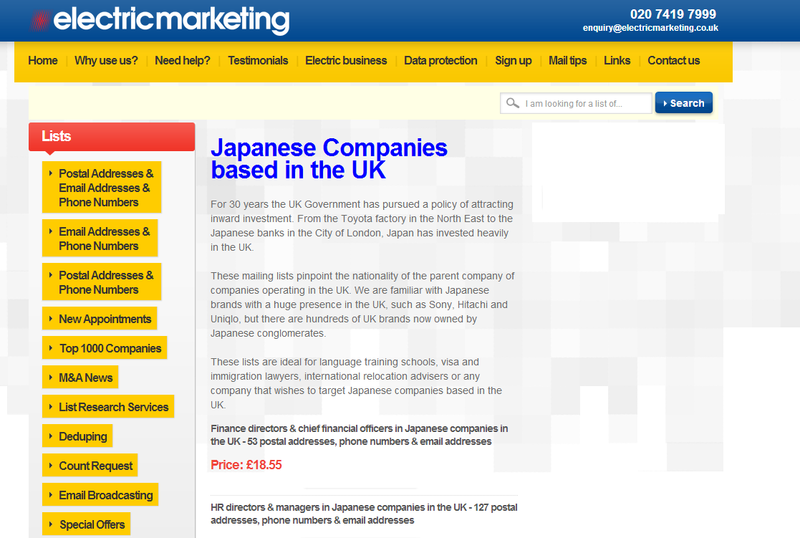 Just email Robert at electricmarketing.co.uk with the nation which interests you. These lists are ideal for business language schools, translation services, visa and immigration lawyers, international relocation advisers and M&A advisers or any company that wishes to target companies whose parent company is not based in the UK. If you are using these mailing lists, it is best not to specify a turnover band or number of employees limit. Mostly these companies do not publish annual sales for the UK only or give details of employee numbers country by country. Their annual reports feature Europe-wide or even worldwide sales figures which we don’t record. 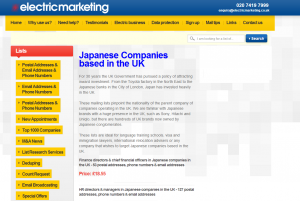 Suffice to say that if a Japanese, US, Chinese or Indian company is in the UK, it is a big company with budget to spend and worthy of your marketing team’s attention. It is not hard to find a business which has had a bad experience of buying an email list. And there are plenty of bloggers who preach building your own email list organically by getting people to sign up on your website. This is good eMarketing practice but building a sizeable list of clients, prospects and interested parties can take years. If you aren’t sure whether buying an email list is right for your company, ask yourself if your business fits into any of these categories. Your business is a new start up with a handful of happy customers and you want to find more customers. Quickly. Your business is an established business which has surplus stock or unexpected spare capacity to take on new work. Your business is looking at expanding into new markets eg a conference company runs events on HR issues is moving sideways into conferences on health & safety. The company sells places at the new conference to its existing client base of HR managers and wants to tell health & safety managers about the conference too. The company buys list of email addresses of health and safety managers. Your business has ambitious growth targets and wants to expand. Companies which use email marketing lists include Google, IBM, HP, Oracle, Dell, Fujitsu. Email lists and mailing lists are essential for businesses which want to attract new customers. For a small business or a start up, email marketing is the cheapest way to tell more people about your business. You need not buy a million email addresses and overload yourself and your email server. Email marketing, like direct marketing* can be done in small, manageable chunks. A good email list provider will not insist that you buy the entire list at once. You can start out with a campaign to 500 or 1,000 email addresses. Take it steady while you learn what sort of emails work for your business and your marketplace. If you have not bought email lists before, read our handy guide to the basics of sourcing an email list from a reliable company and avoiding the email list cowboys. *for younger readers, direct marketing was widely practised in the last century and involved marketing using leaflets, envelopes and postage stamps. The European Parliament has voted to adopt the less business-friendly version of the Data Protection Regulation, proposed by the European Parliament’s Civil Liberties Justice and Home Affairs Committee (LIBE) in the November 2013 report.